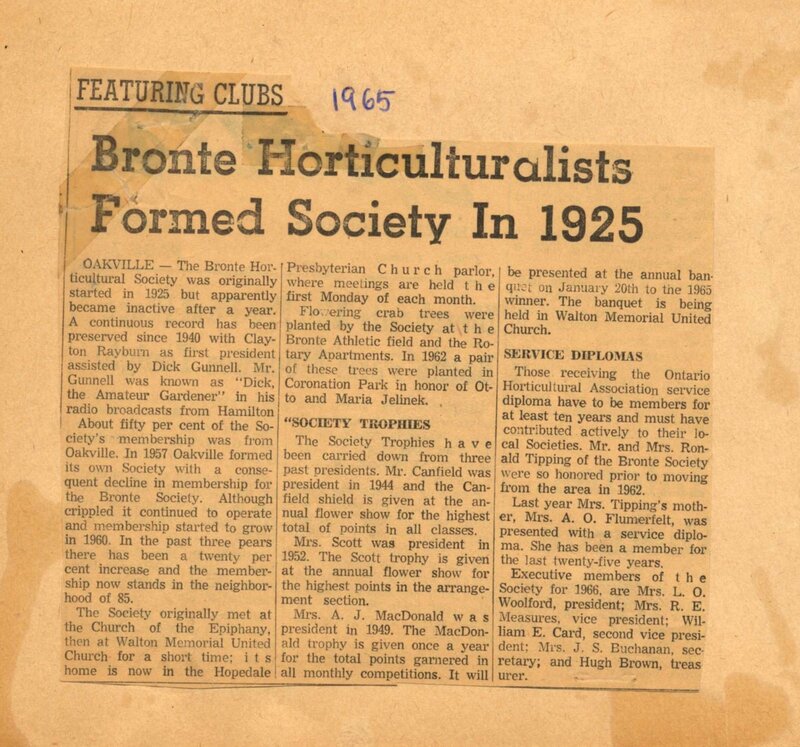 Over the years, Bronte Horticultural Society has preserved the memories and contributions of its members; this has been achieved through the minutes of the organization, in the form of donations for Memorial plaques/benches located in the community and presentation of service awards/certificates of merit to members. 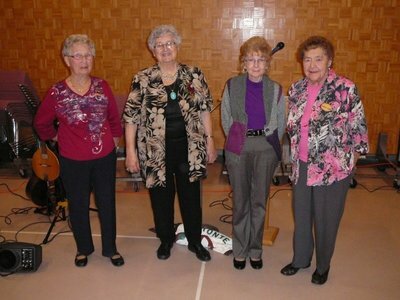 Early Bronte Village residents participated actively in the Society, both as members and on the Board. These long-time residents were involved in many community activities (school, Church, the fishery, early commerce and recreation). They were invested in the area, using their time and energy to improve their community. 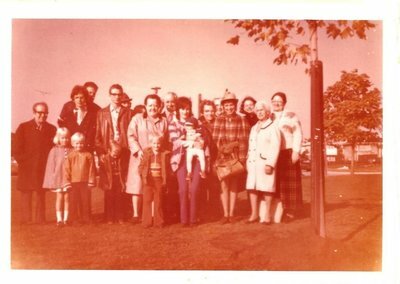 Documentation of these families is located in Oakville Public Library local digital collections, including "The Village of Bronte...Preserving the Past." 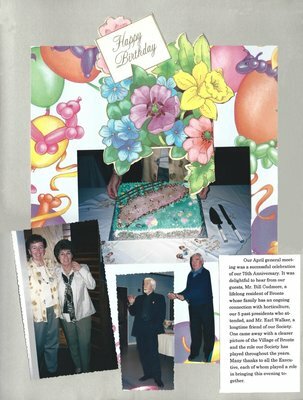 The book, "Walton Memorial United Church, 150 Years" - published in Oakville in 2000 - contains reflections on life in early Bronte. In the 1930s, Mr. Robert A. Hopkins served as a principal at Centriller School, Bronte. 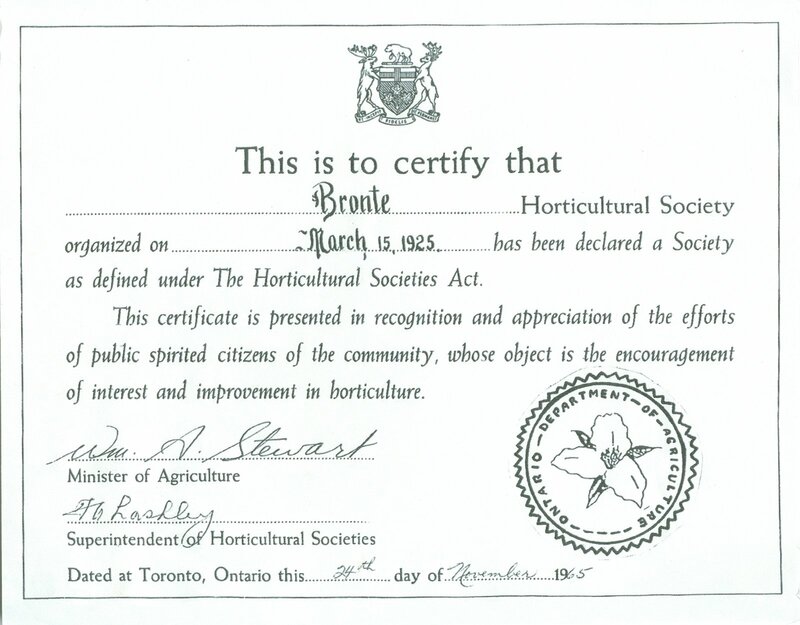 He encouraged junior programs at the Bronte Horticultural Society (BHS) and sponsored youth groups in the community. The students at his school were involved with planting seeds, poster and essay contests, and bird house competitions. The first school garden was established in 1938. 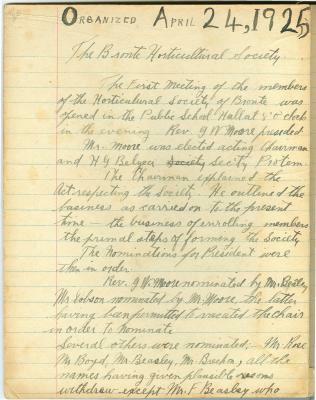 According to the minutes of the Society, Mr. Hopkins was an auditor for the Society. 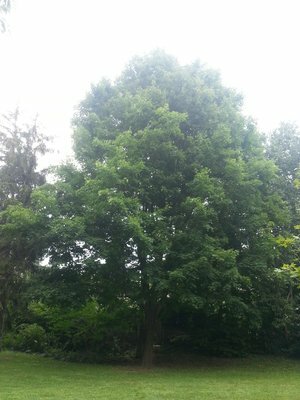 On 15 June, 1939, BHS planted two Blue Spruce trees at the Bronte Public School (later called Centriller) in memory of Elizabeth Cudmore (nee Clary) for her work in starting the first Home & School Club in Bronte and for her work as Vice-Chairman for the Ontario Home & School Club. In the 1960s, the Society held "Bring and Buy" sales at the general meetings - proceeds were intended for the Centennial Fund. The committee for this activity was chaired by Mr. R. Eldon Perkins. 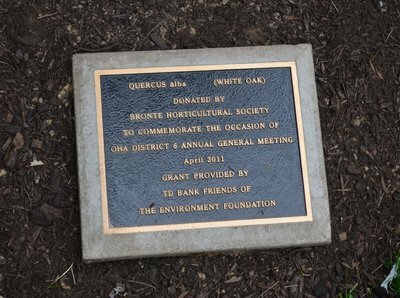 In his memory, the Bronte and Oakville Horticultural Societies placed a plaque under a tree on the trail leading to Maple Valley Park. It read, "Donated October 1974 in memory of R. Eldon Perkins by BHS and OHS." The Perkins family was known for their greenhouse business from 1924 to 1973. Over the passing years, both the original oak tree and the dedication plaque disappeared. 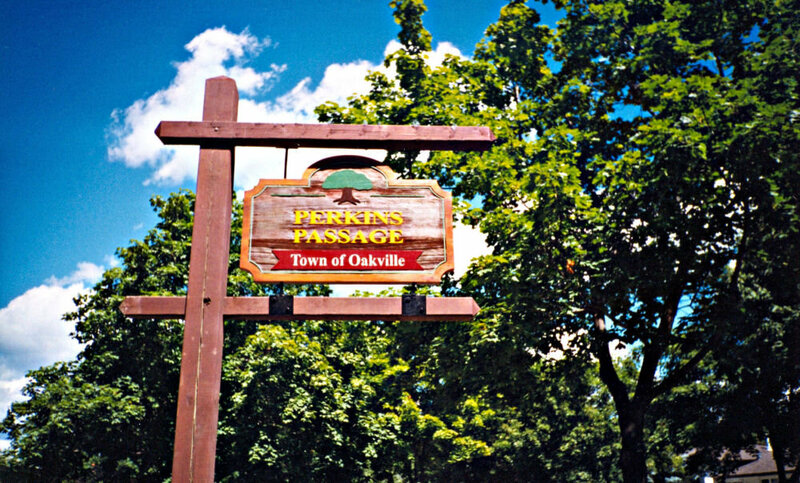 On August 19, 2015, the Town of Oakville located a suitable sugar maple tree, at the foot of which a replacement plaque was installed. 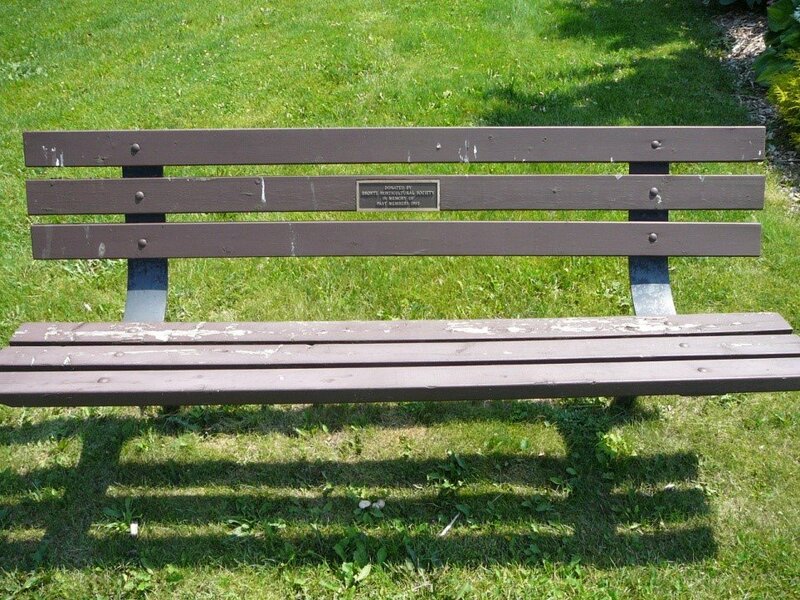 The inscription on the plaque reads as follows: "Donated October 1974 in Memory of R. Eldon Perkins by BHS and OHS"
In 1999, the family was further recognized with a new park, "Perkins Passage," which is near the original land owned by the family. - 1938: A large fountain donated to Commemoration Park. The Fountain was unveiled July 13 1939. However, no one knows where this park was. 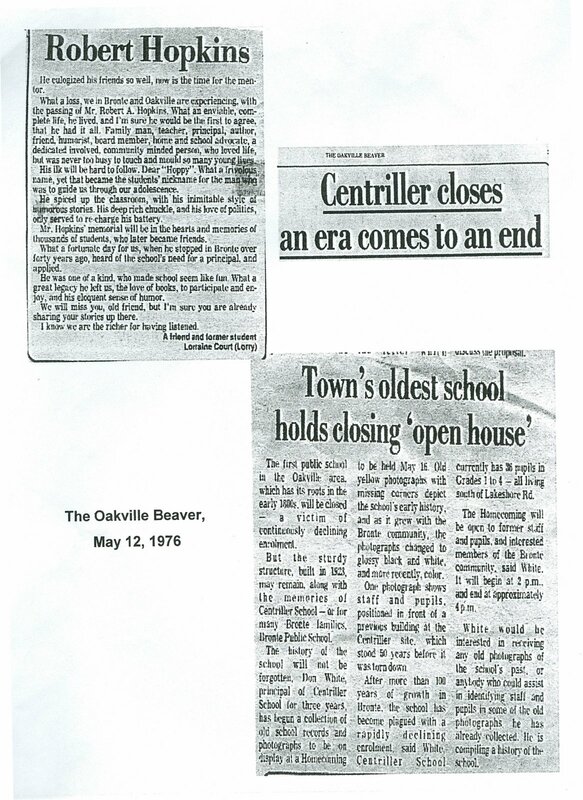 It was originally suspected that it was at the south end of what was later called Centriller Public School. Others have suggested that it was at the Gore. The Society has been unable to confirm either and so the investigation continues. 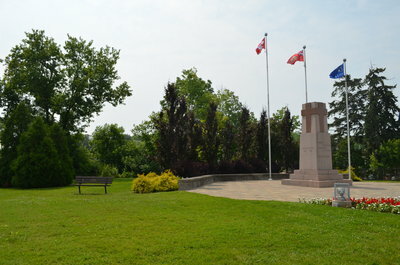 - 1993 & 1998: Two benches, one at the S/E corner of Lakeshore Road & Bronte Road, and one at Chris Volkes Memorial Park. 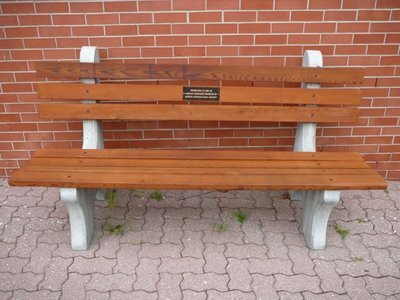 These two benches were placed in memory of past members of the Society. Inscription reads "Presented in 1998 to Honour Deceased Members of Bronte Horticultural Society." 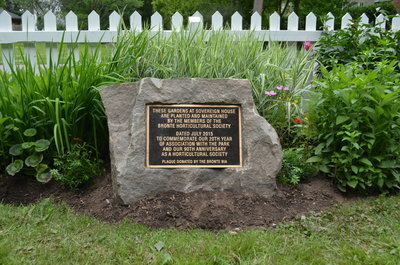 Other items recognizing the contributions of the Bronte Horticultural Society include plaques installed at many public planting sites. In 2013, a legacy tree was planted and a plaque installed at Sovereign House to acknowledge District 6 AGM at Bronte. TD Bank provided a grant for this occasion. 1. April 1952: "It was suggested that if the (flower) show could be held on Tuesday, as the first day, that there would be a better chance to cut flowers Sunday evening - giving time to the wives who are working and to the husbands to assist." 2. November 1956: Letter from Oakville members stating that, due to large numbers of members who are residents of Oakville, who find the driving difficult, it had been suggested that an Oakville Horticultural Society be formed. 3. 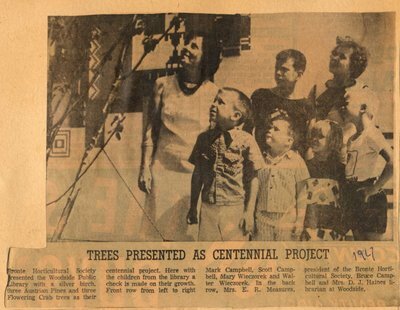 Centennial Year 1967: "We have lost some of our elderly members to the high cost of living and the fact that there are certain of them who have moved into apartments." Per, 1967 BHS annual report of activities. 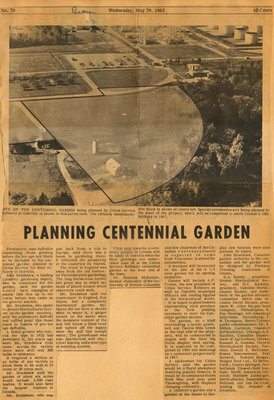 Members of the Society were included in the planning of a Centennial Garden - a project sponsored by Cities Service Oil Co. Refinery (west end of town). 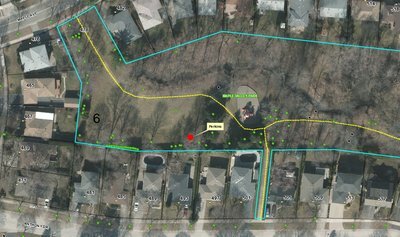 This garden covered ~6 acres, with the largest water fountain in Canada; its location was described as being on a bluff overlooking a scenic green belt and 12 Mile Creek. 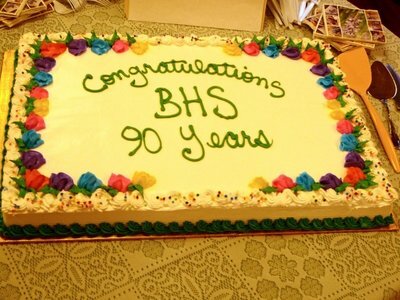 The Society celebrated its 75th Anniversary, April 2000 – each member was given a replica of the certificate declaring BHS as a Society, organized March 15, 1925. The original document was signed by the Minister of Agriculture and Superintendent of Horticultural Societies. 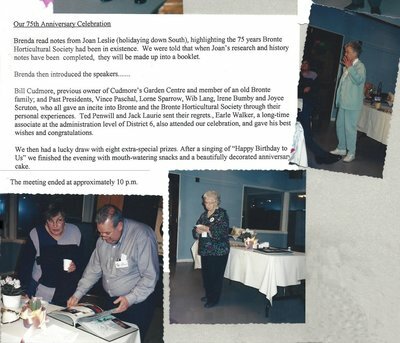 Speakers at the 75th Anniversary included Bill Cudmore, previous owner of Cudmore's Garden Centre and member of an old Bronte family; and Past Presidents, Vince Paschal, Lorne Sparrow, Wib Lang, Irene Bumby and Joyce Scruton. They each gave insight into Bronte and BHS through their personal experiences. Earle Walker, a long-time associate at the administration level of District 6, also attended the celebration, and gave his best wishes and congratulations. After a raffle with eight special prizes and singing "Happy Birthday to Us" with the group, members enjoyed snacks and a beautifully decorated anniversary cake. 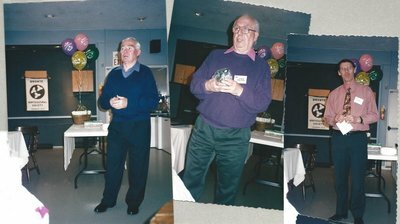 In 2012, at our Annual General Meeting, which is now held in December of each year, we recognized some long-term members of our organization with 20-year pins. 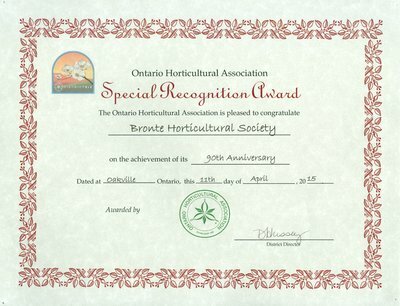 To mark our 90th Anniversary, April 2015 – the Society was presented with certificates from the Ontario Horticultural Association (including District 6) and a letter of congratulations from the Town of Oakville. Of course, we would be remiss not to mention the celebration of our 90th anniversary in April, 2015. There’s no better way to celebrate than with a piece of cake! In recognition of maintaining the gardens at Sovereign House since 1995 and of celebrating our 90th anniversary, the Bronte BIA helped us unveil a plaque on July 8th, 2015. Present for the unveiling were Bronte Horticultural Society President Paula Warwick, John Leard, President of the Bronte Historical Society, Bronte BIA’s Vice-Chair Carolyn Moshtagh and Executive Director Ann Sargent, Local and Regional Councillor Sean O’Meara and BIA Board Member/Ward 1 Councillor Ralph Robinson.